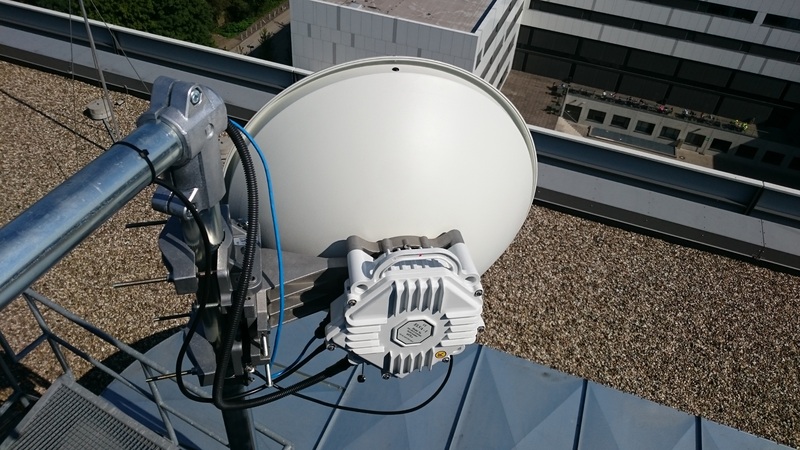 ELVA-1 announced successful installation of PPC-10G ultra-high throughput millimeter wave link for Ruhr-Universität Bochum university by Omnitron Griese GmbH, ELVA’s partner. The link works at E-band 71-76&81-86 GHz, which is light licensed frequency band in Germany. 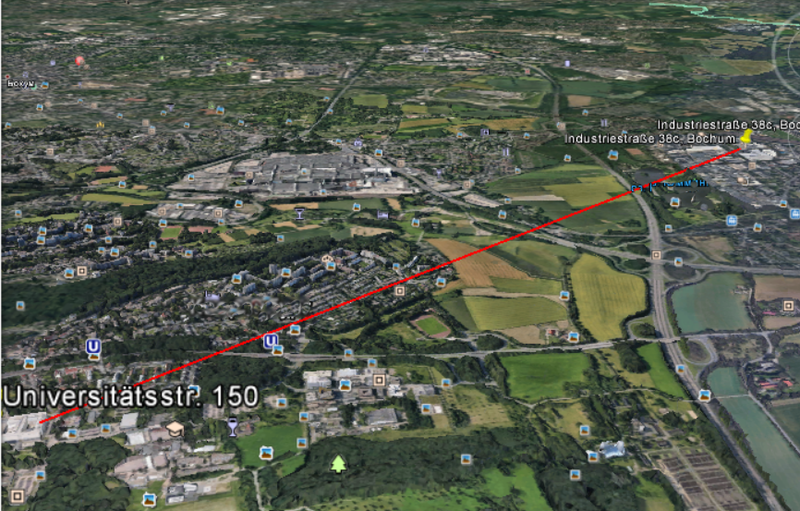 This PPC-10G link is intended to connect two university campuses on distance of 3940 m (2.45 miles) over rural area. Omnitron’s and RUB’s Computing Networks Department personnel worked together on this project to establish true 10 Gbps wireless connectivity. ELVA-1 is well-known supplier of mm-wave scientific equipment for German universities, while 10 Gbps E-band links is new promising equipment for this academic market. The radio is equipped with 60 cm antenna by default; however, other antenna sizes are also available. The PPC-10G is normally mounted in a rooftop or tower location, and contains slots for SFP/SFP+ modules to connect to a LAN/WAN network. Andreas Klipp from RUB Computing Networks Department has commented the link installation — “We have chosen ELVA 10 Gbps to speed-up of setting new 10 Gigabit Ethernet connection between Ruhr-Universität Bochum buildings. The other reason was to save money as for 10G fiber rent we would pay 4500 € per month and huge development costs of 60000 € to bring the fiber between the buildings. More over, we were interested to try this modern 76 GHz wireless technology in our university. PPC-10G is significantly less expensive”. PPC-10G is IP radio link, providing up to 10 Gbps full-duplex throughput. The link is intended for point-to-point applications such as 4G/LTE/5G Backhaul, Corporate Campus Networks, IPTV, and other Wireless ISP backbones. All ELVA-1 links are designed for interconnection between remote WAN/LAN segments that located on the sites with no fixed line broadband connection. Typically, this is for landscape or industrial barriers or ecology restrictions for ground cable laying like national park, river, lake, airport/railway area, private land, etc. The PPC-10G link site in Ruhr-Universität Bochum (RUB) is available for guest visit and demo. Please arrange your guest visit to RUB and all PPC-10G talks with Omnitron. Your contact person is Marc Bezani, email: bezani[at]omnitron.de tel mobile: +49 173 681 05 05. The Ruhr-University Bochum is one of the largest universities in Germany and part of the Deutsche Forschungsgemeinschaft, the most important German research funding organization. Ruhr-University is financed and administered by the state of North Rhine-Westphalia. Currently, 42K+ students are enrolled, and the university employs around 5,600 staff (400+ of which are professors), making it one of the ten largest universities in Germany. RUB Computing Networks Department provides information and communication and media technology for research, teaching, study and administration. Since 1977, OMNITRON has become established as a competent partner. As suppliers of a comprehensive range of products, we offer individual solutions that address complex tasks and challenges in the fields of mobile power supply and digital microwave equipment. Over the many years we have been in this business, we have gained a wealth of experience that is unrivalled in this fast-paced industry. High-quality materials and primary products as well as our "Made in Germany" production of accu packs ensures a high level of quality. We integrate new technologies in order to enhance product features and we work hard to ensure the sustainable operational reliability of installed systems. We seek to offer excellent customer service, including active after sales support for our customers.